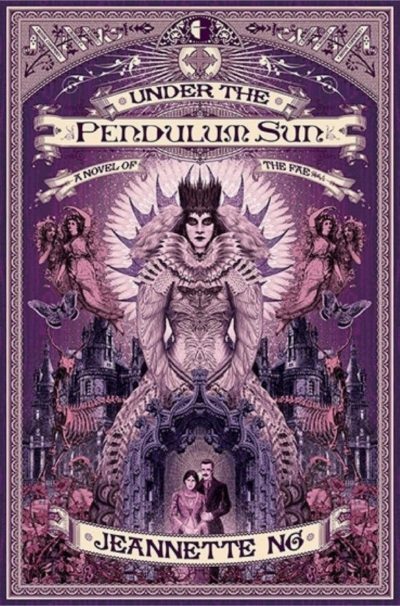 Jeannette Ng’s 2017 Under the Pendulum Sun: A Novel of the Fae is a standalone Gothic fantasy novel. In this world, Captain Cook’s explorations found a route to the Faelands. Just as India, China, and other far off lands were eventually forced to grant Englishmen access, so too has Arcadia been opened to traders, diplomats, and others. Change has come into the world beneath the Pendulum Sun. The Reverend Laon Helstone has travelled to Arcadia hoping to convert the heathen to the one true, Anglican, faith. Was he successful? Impossible to say, as no word has returned from this visitor to the Faerie realm. The silence is ominous, given the fate of his predecessor. Concerned for his well-being, his sister Catherine Helstone follows in Laon’s footsteps. Catherine arrives at the rambling Faerie estate where Laon has been given residence. Her brother is not there (at the moment) but Catherine is welcomed by the other inhabitants: housekeeper Salamander, the changeling Ariel Davenport, and Mr. Benjamin, a goblin. He is the only convert to Christianity. Catherine must make her way in this odd household without her brother’s help. While not overtly hostile, the fae are inherently other and the ways of the dreamlike realm are often odd — even, at times, dangerous. She is relieved when her brother returns. Relief is temporary. Laon has returned in haste to prepare the estate for an important guest. Queen Mab herself is coming to visit. The fae are in general unpredictably dangerous; the Queen is more dangerous than most. Worse yet, she has taken a close personal interest in Laon and Catherine. For reasons unknown and possibly dire. Ng caught my attention with her essay, The Science of the Pendulum Sun. Many authors, having worked out a detailed setting, would then want to showcase their ingenuity in the text. Ng does not do “Hey look at me!” She reveals only those aspects of the Faelands that come to Catherine’s attention. Catherine is not a natural scientist and is not especially observant. Readers can see the shadows of Ng’s worldbuilding, but are left to puzzle out the larger implications on their own. Catherine is far more interested in her brother and his efforts … and in the theological implications of the existence of Arcadia and its natives. Whence their paranormal talents? Do they have souls? Can they be saved? The Anglican church has yet to puzzle out the issues; the Helstones may be instrumental in shaping the answers. The siblings do seem to be the first in the field. Laon’s unfortunate predecessor left behind no ruminations on such topics. Wasps are theologically troubling; even more so the fae. Laon and Catherine work to reconcile what their faith tells them about the world with what they find in the dreamlike realm of the fae. Despite being theological in focus, the questions they ask are not inherently nonsensical. There may be some middle ground between the world as they believe it to be and the world as it is revealed to them in Arcadia. The answers to their questions may not make them happy … but you cannot have everything. While certain elements of the plot may strike readers as unsavoury (let’s just say that the siblings are very close) Ng’s novel is an engaging exploration of an alien realm. Its naïve protagonists are worthy guides to an odd and melancholy world. Under the Pendulum Sun is available here (Amazon) and here (Chapters-Indigo). Bought it from Angry Robot because they make it clear that they don't use DRM. I'm sure you don't get a cut that way. Can you clarify (and maybe make Chapters-Indigo do so) which ebooks do and don't have DRM? Thanks. I am not sure how to go about doing that but will investigate.